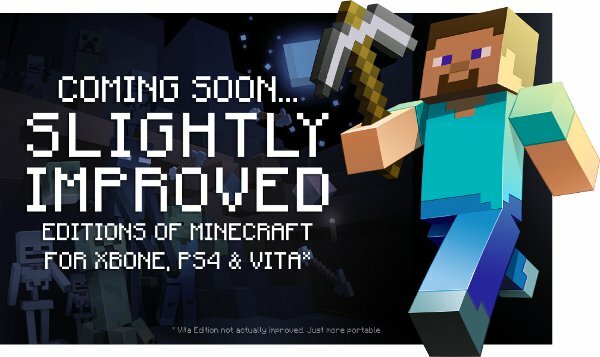 Minecraft creators Mojang confirmed today that the PS4, Xbox One and PS Vita versions will be arriving in August. They also provided a few crucial details on each version, including discounts for previous owners of Minecraft. "Apologies for the delay, but putting Minecraft on new consoles is a serious business," Mojang's Owen Hill said in a company blog post. "People have been using phrases like 'logistically-speaking,' 'infinite terrain,' and 'platform parity' for months now." "We’ve decided that letting current players upgrade for a small fee is the best way to show our appreciation. If you’re a new crafter who’s looking to pick up Minecraft in the next few months – welcome!" Minecraft Xbox One Edition will be priced at $19.99. However, if you bought the game through Xbox Live, or played online with the DVD version, you can upgrade to the Xbox One edition for $4.99. This discount will be available for at least a year after Minecraft launches on XB1. As previously announced, worlds from Minecraft Xbox 360 Edition can be imported into its Xbox One counterpart. However, Xbox One worlds can't be imported into Xbox 360 because of the larger world sizes on XB1. Cross-platform play also isn't possible. Some DLC from the Xbox 360 edition can be used on Xbox One. Certain add-ons won't carry over due to licensing restrictions. Mojang didn't mention which DLC is restricted in this way. The Vita version costs $19.99 and has all of the features from the PS3 version. As a result, all DLC from the PS3 version will work on Vita. It's a Cross-buy title so if you've bought it on PS3, you can download it for no additional charge on Vita. Saves can be transferred back and forth between the two platforms. Minecraft PS4 Edition, like the Xbox One version, allows for larger worlds and a greater draw distance than last-gen versions. Worlds can be imported from the PS3 version but no exported to it. The game is $19.99 but $4.99 if you're an owner of the PS3 version. There's no cross-platform play between the PS4 and PS3/Vita. Some DLC packs can't be imported from PS3 because of licensing issues.